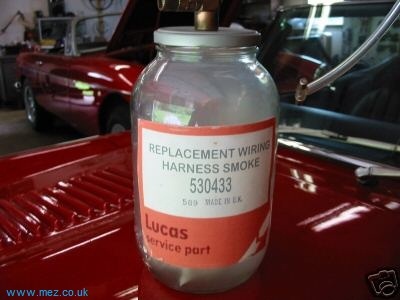 Duplicate of the Lucas Wiring Harness smoke Ebay Item. This was a classic auction, Ive duplicated it here as it will disappear from ebay after a while. Unlike the cheap, far-eastern replacement DIYsmoke offered by the "usual suppliers", this kit includes a filter to ensure that all the smoke is of consistent size, It has been our experience in our shop that the reproduction Tiawanese smoke is often "lumpy", which will cause excessive resistance in our finely-engineered British harnesses and components. This is often the cause of failure in the repro electrical parts currently available, causing much consternation and misplaced cursing of the big three suppliers. Here's a few of the 70 of questions asked! Q: I have a fourteen year old son named Lucas who I have caught several times in the back of the garage smoking. Can this item help him to respect a little firm parental intervention and aid him in smoking less...or even stopping altogether? A: Part of the problem may be the fact that you named your son after the Prince Of Darkness. Mayhaps you should be happy that all you have caught him doing in the back of the garage is smoking! My suggestion is: since you already have spoiled him for life with his moniker, you search the 'Bay for a proper Little British Car to restore as a father-and-son project. That way, he'll have a way to fill the idle hours he'd have spent chasing girls had he been named Rocky or something more suitable. Plus, he'll learn first-handed how disgusting smoke can be. Alas, though, not with this unit, because whilst trying to photograph it for a spread in "Popular Ether Technology", it was unfortunately broken. Therefore, the auction must be terminated early. Thanks for the heartwarming interest! Q: I have been very diligent over the years and have maintained the smoke in my Sunbeam's wires perfectly. The problem is that that special Lucas perfume has disappeared from the dash, carpets and seats. In fact, at the last Concours d'Elegance I lost out to a frogeye with period odors. Is the smoke in your kit fresh enough to bring back the OEM smells of burning plastic and bakelite and are you including an adapter to replace same. A: No adapter needed, but have you tried just STARTING that overrestored trailer queen? It might bring back the aroma by itself. Q: This has been a most informative thread which set me off thinking about wider global environmental changes that have happened since the mid 70's. Could it be that the copious release of smoke from Lucas wiring looms around that time has significantly contributed to the holes in the ozone layer and the onset of global warming? Could it be that, had your excellent device been more available at that time, we could have saved the planet for future generations instead of fighting a rear guard action? Hindsight is such a wonderful thing isn't it. A: Hey- This is a serious site- we're not discussing "junk science" like Global Climate Change! Q: I have a questions. For some time. My object is to restore a the few pre-Chrysler Rootes Sunbeam Tigers to original factory condition, with ALL the LAT racing options. So far, I have been quite successful, but unaware of your Lucas Smoke Kit. I am perplexed as to it's satistactory application to this original British Classic that Mr. Carroll Shelby has enhanced with a lot of Ford (USA) parts. This includes a large portion, but not all, of the electrics. It is very easy to differentiate between the Lucas Parts and the Ford Parts, as the Ford Parts still work. While we cn admire Mr. Lucas for the development of the intermittent windshield wiper, the self-dimming lighting system, and the colorful turn signal spark generator, it is unclear whether your offering wll work satisfactorily with so much of the electrics originating in the US. Is this device compatible, as the US parts do not show signs of leaking smoke? A: The Lucas smoke may cause failure of the connecting interstices, but the, so will everything else. Q: Maybe you can help me. I have an old generator that I have suspected of having a metaphysical ozone leak for several years. It’s one of those things I feel I know to be true but cannot prove. Anyway, through an ingenious marriage of a Sharper Image Ionic Breeze air purifier and a breast milk pump, (by the way, both were obtained on ebay) I have devised a way to recharge the ozone that I can smell leaking from the generator. But, you guessed it, when I disconnect the wiring to introduce the replacement ozone I invariably cause a smoke leak. Do you think there is a way to mate our two machines in such a way that I could “kill two birds with a single stone” – if you will. 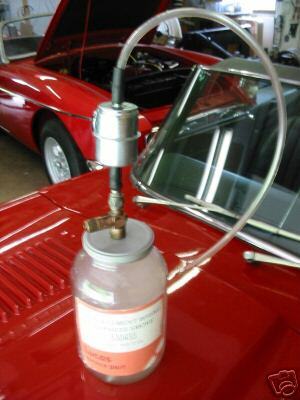 Q: Can I use this device to replace the smoke in my Alfa Spider? Is Brit smoke the same as Italian smoke? A: Only if it's pre-Bosch. 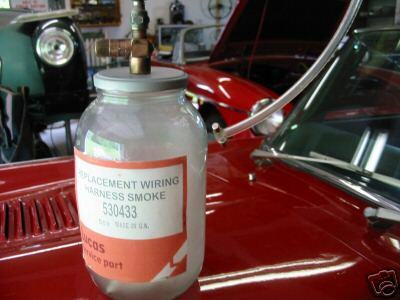 Q: Will this kit put back ALL the smoke in a 1975 Midget wire harness? Some time ago while driving our 75 Midget smoke began pouring from under the hood, after pulling over, smoke was immediately followed by flames. A HUGE amount of smoke was lost from the wire harness (10 minutes worth before the fire deparment showed up). Your jar appears to be too small to contain the volume of smoke produced by the Midget on that day. Please specify quatity of smoke. PS - Would you know where can get bulk replacment glue on insulation, there is none left on any part of the wire harness under the hood. The harness appears to be intact but is lacking smoke holding insulation. I'm planning on rerouting the main power buss from over top of the fuel line. This way next time I will have smoke, red hot wires without melting thru the fuel line. Thanks in advance. A: You'll need bulk smoke, but I'd try your last suggestion before ordering any. Good luck! Q: Is this setup on the "metric system" or can it be used universally? I have a MB 380SL but have replaced some of the wirings with U.S. products. Will your product make the transition? Also, are there any EPA limitations on shipping? A: This setup is Whitworth only. sorry. Q: Does this unit contain new or re-cycled smoke and will if my 1966 Triumph Bonneville motorcycle? A: This is new, previously un-leaked smoke, as originally installed on your T-120. Have at it! Q: Would this product fix the Miller dynamo on my motorbike? The smoke got out of it years ago and I am in despair. Having to run a total loss electrical system now. Please, no smart-alec comments about nothing to lose. I have been desparate for a cure for years and will jump at anything. I get so depressed. But I really liked your answers to all the questions. I learned so much. You must be smart. What are some good upgrades for my bike? 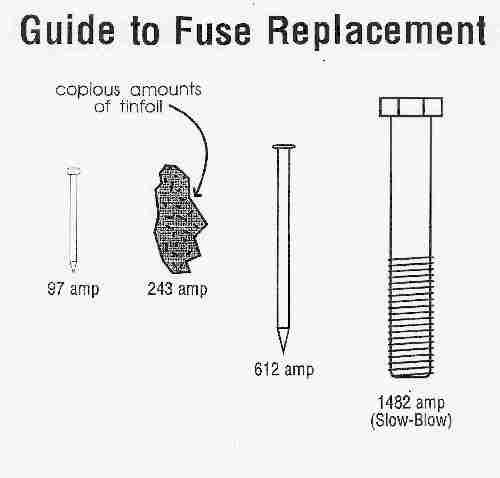 Should I get a Boyer electronic ignition? A: Could be. I can't remember. Q: I have the idential part but needs the smoke refill cartage, i was told to ring 84433 3-33888444555 or speed dial 666 is that you? A: No, that's that shop in Michigan. Q: Do you have any idea if the kit will work on Alfa Romeos? My 1963 Giulia has bullet connectors, a Lucas windshield wiper motor, and a variety of other Lucas components. Earlier Alfas had lots more Lucas stuff, such as starter motor and generator, so I imagine it's more suited to them. On a different note, did Alfa's change from Lucas to Bosch signify the end of the of the 'Italian masochistic' era? A: This will work with the Lucas portions. The Bosch change was a misbeggoten effort to work around the simultaneous Italian/British Stevedore Strikes of the early 70s. A: Got me. I got my VIC-20 to run one game of "Hangman" with just a spritz, though. Q: Enough, enough already! I cannot allow you to perpetuate this lowbrow fraud any longer! Anyone with any knowledge of Lucas products should recognize that the Lucas label art on the jar is wrong for this early version of the smoke kit. And of course, the lid should be black with the valve oriented 180º to the label. The smoke color itself is not original to the early cloth insulated wiring and perhaps even for the early plastic insulation. Bidders beware, this is most certainly a replica, and a poor one at that — possibly from Taiwan. Additionally, the smoke replacement kit was meant to be used only by highly qualified personnel. The dangers of misuse are indescribable - certainly I can't…, but the phrase "gone up in smoke" was born of this process. A: Oh, yeah? well, in the interest of openness, I'm going to place your tirade on the site. That doesn't mean I like it, though. Q: I wonder if you would do an exchange (with a cash adjustment in my favour). I have some bottles of 'bottom air' that was supplied by Dunlop many years ago. The advantage is that it takes up very little space as of course when you get a flat the top air in the tyre remains perfectly serviceable, it's only the bottom air that needs replacing. I will wait your reply. All the best from the UK. A: If this is the proper bottom air for a set of 4.00X 10 Gold Seals, we may be able to work a deal. We have a '68 Moke in the shop with original rubber, and the domestic bottom air keeps migrating out. It evidently deoesn't have enough atmospheric British ambient smoke to fill the pores in the tyres. Q: Geez, I wish I had seen this auction before I bought some "off-shore" smoke. I didn't realize there was some OEM stuff left. To make matters worse, I switched to synthetic smoke (yeah, I know) but it seemed like the right thing to do at the time. Unfortunately for my 72 Range Rover, I have not yet been able to fashion an effective bypass for the optional Fairey smoke pump which has recently failed. If only you could have made this item available earlier! Comments, questions or got answers? Please use the Mez Forums to get in contact or chat about this page.